We will be showing you how to make your own herbal christmas presents. The workshop will talk you through the basics of how we turn herbs into products and you will get a chance to have a go yourself and take home what you make. You will take home a small pack of your own crafted teabags and a personalised lipbalm that you can give as a gift or keep as a treat for yourself! Tickets £12. Full details and booking via biletto. We will be showing you how to make your own herbal christmas presents. The workshop will talk you through the basics of how we turn herbs into products and you will get a chance to have a go yourself and take home what you make. You will take home a pot of herbal scrub and a personalised lipbalm that you can give as a gift or keep as a treat for yourself! Tickets £12. Full details and booking via biletto. Join us in celebrating the age-old marriage of alcohol and herbs at a time of post-harvest abundance. Experiences include the Valerian Den and experimenting with herbal concoctions at our Herbal Apotheca. Delicious local food and herbal cocktails with guest distillers. This is a fundraising event for Hackney Herbal. Proceeds will go towards the continuation of our work in the community. Learn how to grow, harvest, dry and turn herbs into herbal tea. This workshop is being organised as a Capital Growth training session. Tickets £12.50 (capital growth member) / £20 (non-member). More info and booking here. An evening of herbal tea tasting and story telling focusing on our Hackney-grown Midsummer tea blend of 7 herbs. You’ll get to try out lots of unique herbal tea blends and have a go at creating your own by picking fresh herbs that are growing at the Bee Garden. Tickets £15 to cover all materials and refreshments. More info and booking here. Join us for our Hackney Herbal summer social gathering. We’ll also be sampling our 7 herbs / 7 fields herbal blend. Bring food to share. Please see facebook event for more details or email us to say you would like to come along. A beginner’s introduction to the traditional method of cold process soap making. The demonstrations in this workshop will give you the confidence (and the comprehensive notes) to start making your own soaps with equipment you probably already have at home. FREE! Take home your own calendula soap on the day plus a Hackney Herbal goodie bag! Please email us to book a free space. Making herbal tinctures to create lotions. 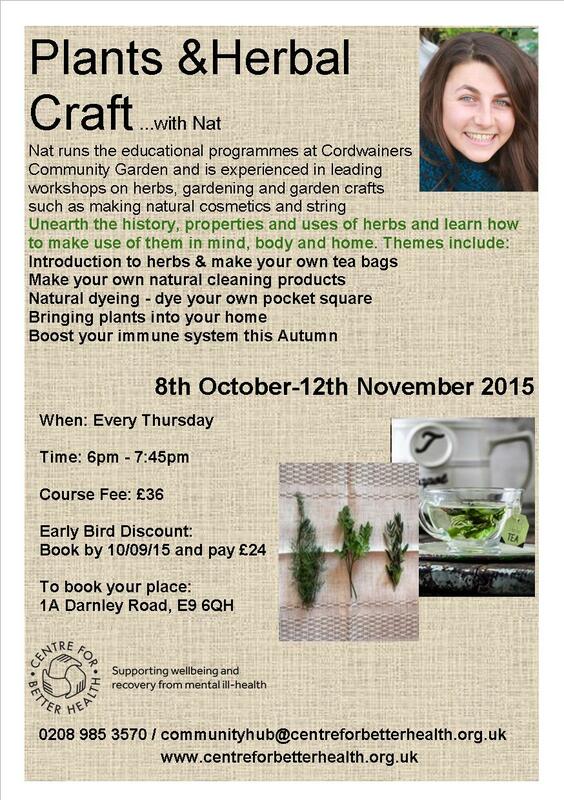 An afternoon with Gone Wild Herbs bringing you a session of herbal experimenting, skill-sharing and learning. We’ll be looking at the benefit of spring herbs and making tonics. Suggested £5 donation. Please email us to book a space. Take home your own calendula soap on the day. There will be refreshments about halfway through the workshop so please have lunch before arriving. Frizzante cafe at Hackney City Farm serves lunch from 10am till 4pm. The pre-summer Plant and Herbal Craft course is back for Autumn with a seasonal twist! With the temperatures dropping and nights drawing in, find ways to bring the garden in to your home so you can enjoy the benefits of plants all year round. Learn how to make your own natural cleaning products, naturally-dyed pocket square and herbal tea bags! We will also be boosting our immune systems with the help of herbs.